A Perfect Day for Riding, But… – Run. Ride. Roam. We woke up this morning to a real pea-souper of a fog, which meant a very wet tent was packed away. It eventually cleared though into a day absolutely perfect for riding – sunny, warm, no wind, just what a cyclist wants, but…the trouble is we didn’t ride! Now, you’d be forgiven for asking the question, “Isn’t this supposed to be a cycling tour?” and I promise you, yes indeed it is, despite the fact that we ended up on a train again today. We had planned to ride on today to Angers, at which time we would turn left and head north to Normandy. Late last night though, after consulting maps, calculating distances, consulting the calendar and the time we have left before needing to be in Peronne on April 24, we made a late, last minute change of plans. We really want to have time to explore Normandy and it was looking like we would have limited time if we cycled the whole way north, so in the end, late last night we decided to just get to Normandy by train. We decided this would stop us feeling rushed or pressured by time and we would be able to relax a bit and see the places we really want to see and explore the history of the region. So, that’s what we did. This meant that today was yet another day spent hanging around train stations and sitting on trains. I know it’s a means to an end but I really hope today is our last train journey because I really don’t like travelling this way. I find taking the bikes on trains quite hard and stressful. As we head to the station, I’m just hoping upon hope…”Please let there be ramps or elevators, please don’t have steep stairs to get bikes up or down,” because we don’t know until we get there what the access at a station will be like. I really don’t like having to push a loaded bike up and down stairs and even escalators are hard. Then when we make it to the platform and we’re waiting for the train, I’m hoping upon hope, “Please let there be a low step onto the train, please don’t be a high step to get through the door,” because again, we don’t know until the train pulls up what it will be like and we’ve had some really high steps to try and get the bikes up and onto the train. So all of that, I find quite stressful and I’d rather just be cycling. Today we left from the station at Ancenis, which had steep steps to get up to the platform and we needed to get to the platform on the other side of the tracks. We actually did something we probably shouldn’t have done, which was to use an access ramp that crossed the tracks. I’m sure it’s only for rail workers, but we pushed the bikes down the platform and raced them down the little ramp and up the other side to get to the platform we needed to be on. Not recommended in terms of safety, but it was that or the stairs again. I’m really intrigued about the access situation at train stations, because I don’t know what people with limited mobility or wheelchairs are supposed to do when faced with steep flights of stairs and no ramps or elevators. Anyway, we made it to the platform. The train arrived and there was a step, but not too high, so we got the bikes on board OK. Waiting around in another train station! 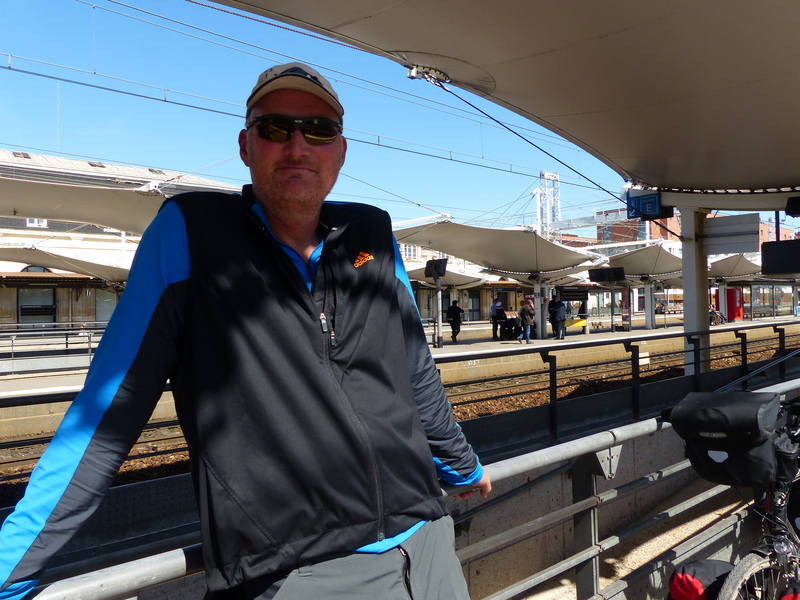 We had to change trains at Le Mans, so we had a bit of time at Le Mans station before catching our train onto our destination of Caen. Thankfully, Le Mans station had elevators and ramps onto the platform. Yay! Now, it was just worrying about what the access onto the actual train would be like. The train pulled up, there was a step, but it wasn’t too high, so we were able to get the bikes on board. Then we were faced with the next challenge which we have come across before when taking trains…people who sit in the spaces allocated for bikes or put their luggage in those spaces and then don’t move. More than once, we’ve had people sitting in the space for bikes and even though we are clearly trying to get the bikes on and into a space out of people’s way, we are watched struggling to do this, but the people in the bike places don’t move! This happened again today. I was trying to get my bike into one of the three spaces allocated for bikes, knowing Steve was behind me still to get on and another lady with her bike was behind Steve and would also need a space. I tried to get the bike into a space but two people had put their luggage there. Thankfully, they moved the suitcases, but then there were still people standing in the space and wouldn’t move. The lady with her bike who was getting on with us, looked to me and I gestured that I couldn’t move because there were people in the way. Anyway, this went on for a while until someone finally moved. Then we had to take all the bags off the bikes, so they could be stored on their back wheels and hung from the hooks on the wall. Once again, without Steve there’s no way I could have done that. I just couldn’t get a bike up that high and hold it on one wheel to be able to hang it. So anyway, all of that faffing about is quite stressful and I don’t look forward to train travel at all. When we arrived at Caen, we thankfully had an elevator to get down from the platform but then had to ride an escalator up to the exit. I find that hard too, trying to hold the loaded bike and stop it rolling backwards down the escalator. I had a nice lady behind me again, who stepped up and held the back of the bike, just in case gravity got the better of me. 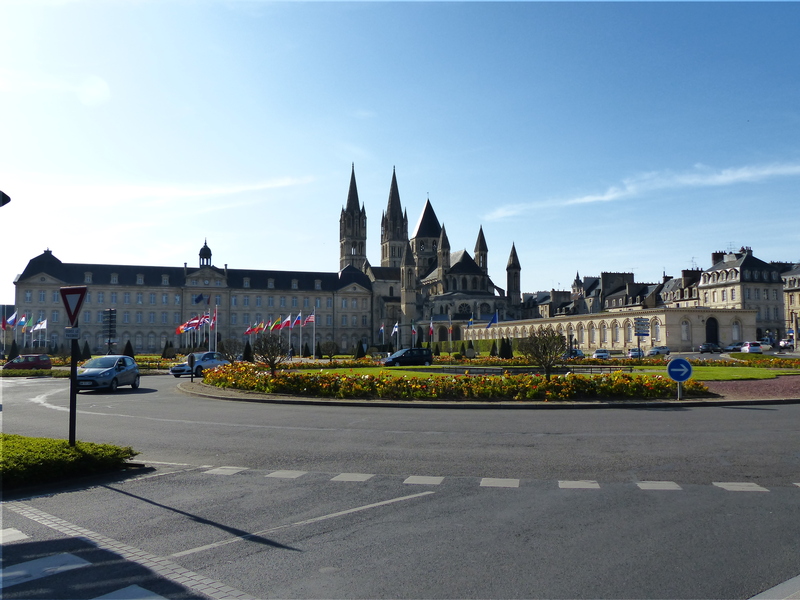 So…finally we emerged from the station and we were in Caen. 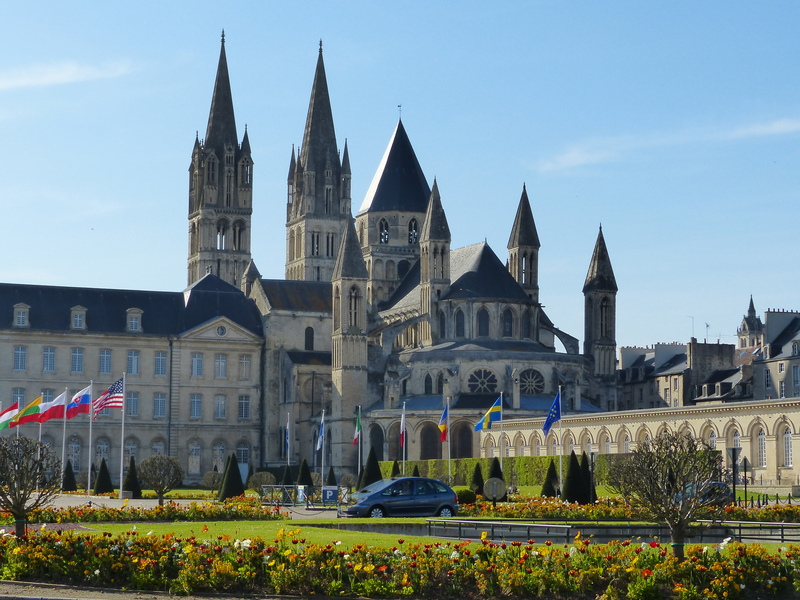 We’re spending a couple of nights here so we can spend time at the Caen Memorial that has lots of exhibits about D-Day and the war history of Normandy and then we hope to cycle on towards the coast and explore some of the historic sites and locations. Yes, we are still touring CYCLISTS! Just noticed the time … hope you are enjoying your elevenses! !